Our congratulations go out to Nicole and Eric for their wedding this weekend! Their invitations are just gorgeous, with subtle hints of blush pink. We worked with them to customize our Hudson design, adding a tinted city skyline silhouette to the invitation and rsvp card. Here is a close up of one of our favorite color combinations - blush and black. We custom mix all of our ink colors for our letterpress printing. The main ingredients for blush colored ink: white, transparent base and warm red. 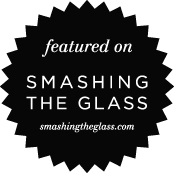 Karen from Smashing the Glass featured the gorgeous wedding of Natalie & Alex recently. We worked with them on their wedding invitations and just loved the whole suite! Its so nice to get a glimpse of the wedding, after working with a couple and we were so excited to see some of their beautiful photos. It was such a romantic wedding, and the bride and groom looked so wonderfully happy!